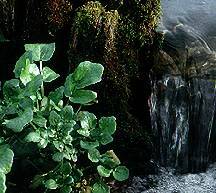 Watercress is used as a general tonic, and its bitter taste is thought to stimulate the appetite and improve digestion. It is a hardy perennial found near springs and other running water. Bitter taste is one of the important components in ayurvedic lifestyles. It stimulates saliva flow and helps balance the body. Its list of uses is long and varied. This herb is most commonly used to alleviate nervous conditions, constipation, and liver disorders. It is known as a remedy for cough and bronchitis. It contains a remarkable substance called rhein, and rhein appears to inhibit the growth of pathogenic bacteria in the intestines. It is believed that rhein is also effective against Candida albicans, fever and inflammation, and pain. Candida is a yeast infection that is alarmingly common in those who have taken antibiotics. Sugar can also increase candida. Click here to read about Candida. This wonderful herb is also used as an antioxidant, a blood purifier, for bone and joint problems, for breathing problems, for cellular regeneration, for cleansing, for gingivitis, for vascular deficiencies, and for colds and congestion. It is also used for detoxification programs. It is now well recognized for helping to prevent lung cancer in smokers as it reduces the level of toxic compounds in their bodies. This plant is rich in Vitamins A and C. Vitamin A is important for eyesight. Vitamin C helps with immunity and to prevent disease. It also includes the minerals sulphur, iodine, calcium, and manganese. Sulphur is very important in the health of the body and it's functioning. Iodine is important for thyroid health and metabolism. Calcium is a critical mineral for all sorts of functions in the body, but most famously bone health. Manganese is also critical for bone health. This herb is one of the ingredients in eight-herb essiac. The only side effects of the herb are, in rare cases, gastrointestinal discomfort. How Important is Watercress to the Essiac formula? The essiac formula is exact and each and every herb is important. The herbs have a synergistic effect. This means that the sum of the eight herbs together is greater than any of the parts. Therefore, if you took the watercress away, the essiac would not work as well. This herb is a common ingredient in salads. It is indeed a food, but can also be used in herbal medicine.